Aspirin, also known as acetylsalicylic acid (ASA), is a medication used to treat pain, fever, and inflammation. Specific inflammatory conditions in which it is used include Kawasaki disease, pericarditis, and rheumatic fever. Aspirin given shortly after a heart attack decreases the risk of death. Aspirin is also used long-term to help prevent heart attacks, strokes, and blood clots in people at high risk. Aspirin may also decrease the risk of certain types of cancer, particularly colorectal cancer. For pain or fever, effects typically begin within 30 minutes. Aspirin is a nonsteroidal anti-inflammatory drugs (NSAIDs) and works similar to other NSAIDs but also irreversibly blocks the normal functioning of platelets. Common side effects include an upset stomach. More significant side effects include stomach ulcers, stomach bleeding, and worsening asthma. Bleeding risk is greater among those who are older, drink alcohol, take other nonsteroidal anti-inflammatory drugs (NSAIDs), or are on blood thinners. Aspirin is not recommended in the last part of pregnancy. It is not generally recommended in children with infections because of the risk of Reye's syndrome. High doses may result in ringing in the ears. Aspirin, in the form of leaves from the willow tree, has been used for its health effects for at least 2,400 years. In 1853, chemist Charles Frédéric Gerhardt treated sodium salicylate with acetyl chloride to produce acetylsalicylic acid for the first time. In the second half of the nineteenth century, other chemists established the chemical structure and came up with more efficient methods to make it. In 1897, scientists at Bayer began studying acetylsalicylic acid as a less-irritating replacement for common salicylate medicines. :69-75 By 1899, Bayer had named the drug Aspirin and was selling it around the world. The word Aspirin was Bayer's brand name; however, Bayer's rights to the trademark were lost or sold in many countries. Aspirin's popularity grew over the first half of the twentieth century leading to fierce competition with many aspirin brands and products. Aspirin is one of the most widely used medications globally with an estimated 40,000 tonnes (50 to 120 billion pills) being consumed each year. It is on the WHO Model List of Essential Medicines, the most important medications needed in a basic health system. Aspirin is available as a generic medication. The wholesale cost in the developing world as of 2014 is 0.002 to 0.025 USD per dose. As of 2015 the cost for a typical month of medication in the United States is less than US$25. Aspirin is used in the treatment of a number of conditions, including fever, pain, rheumatic fever, and inflammatory diseases, such as rheumatoid arthritis, pericarditis, and Kawasaki disease. Lower doses of aspirin have also shown to reduce the risk of death from a heart attack, or the risk of stroke in some circumstances. There is some evidence that aspirin is effective at preventing colorectal cancer, though the mechanisms of this effect are unclear. In the United States low dose aspirin is deemed reasonable in those between 50 and 70 years old who have a more than 10% risk of cardiovascular disease and are not at an increased risk of bleeding who are otherwise healthy. Aspirin is an effective analgesic for acute pain, but is generally considered inferior to ibuprofen for the alleviation of pain because aspirin is more likely to cause gastrointestinal bleeding. Aspirin is generally ineffective for those pains caused by muscle cramps, bloating, gastric distension, or acute skin irritation. As with other NSAIDs, combinations of aspirin and caffeine provide slightly greater pain relief than aspirin alone. Effervescent formulations of aspirin, such as Alka-Seltzer or Blowfish, relieve pain faster than aspirin in tablets, which makes them useful for the treatment of migraines. Topical aspirin may be effective for treating some types of neuropathic pain. Aspirin, either by itself or in a combined formulation, effectively treats certain types of a headache, but its efficacy may be questionable for others. Secondary headaches, meaning those caused by another disorder or trauma, should be promptly treated by a medical provider. Among primary headaches, the International Classification of Headache Disorders distinguishes between tension headache (the most common), migraine, and cluster headache. Aspirin or other over-the-counter analgesics are widely recognized as effective for the treatment of tension headache. Aspirin, especially as a component of an acetaminophen/aspirin/caffeine combination, is considered a first-line therapy in the treatment of migraine, and comparable to lower doses of sumatriptan. It is most effective at stopping migraines when they are first beginning. Like its ability to control pain, aspirin's ability to control fever is due to its action on the prostaglandin system through its irreversible inhibition of COX. Although aspirin's use as an antipyretic in adults is well-established, many medical societies and regulatory agencies (including the American Academy of Family Physicians, the American Academy of Pediatrics, and the U.S. Food and Drug Administration (FDA)) strongly advise against using aspirin for treatment of fever in children because of the risk of Reye's syndrome, a rare but often fatal illness associated with the use of aspirin or other salicylates in children during episodes of viral or bacterial infection. Because of the risk of Reye's syndrome in children, in 1986, the FDA required labeling on all aspirin-containing medications advising against its use in children and teenagers. Aspirin is used as an anti-inflammatory agent for both acute and long-term inflammation, as well as for treatment of inflammatory diseases, such as rheumatoid arthritis. Aspirin is an important part of the treatment of those who have had a myocardial infarction (heart attack). One trial found that among those likely having an ST-segment elevation MI, aspirin saves the life of 1 in 42 by reducing the 30-day death rate from 11.8% to 9.4%. There was no difference in major bleeding, but there was a small increase in minor bleeding amounting to roughly 1 in every 167 people given aspirin. For people who have already had a heart attack or stroke, taking aspirin daily for two years prevented 1 in 50 from having a cardiovascular problem (heart attack, stroke, or death), but also caused non-fatal bleeding problems to occur in 1 of 400 people. Studies have not found an overall benefit in the general population of healthy people, although it is possible that there are small benefits for those at especially high risk, despite never having had a heart attack or stroke in the past. One study found that among those who have never had a heart attack or stroke, taking aspirin daily for 1 year prevents 1 in 1,667 from having a non-fatal heart attack or stroke, but caused 1 in 3,333 to have a non-fatal bleeding event. However, the study population were at relatively higher risk than those who had never had a heart attack or stroke. Aspirin appears to offer little benefit to those at lower risk of heart attack or stroke—for instance, those without a history of these events or with pre-existing disease. Some studies recommend aspirin on a case-by-case basis, while others have suggested the risks of other events, such as gastrointestinal bleeding, were enough to outweigh any potential benefit, and recommended against using aspirin for primary prevention entirely. Aspirin has also been suggested as a component of a polypill for prevention of cardiovascular disease. Complicating the use of aspirin for prevention is the phenomenon of aspirin resistance. For people who are resistant, aspirin's efficacy is reduced. Some authors have suggested testing regimens to identify people who are resistant to aspirin. After percutaneous coronary interventions (PCIs), such as the placement of a coronary artery stent, a U.S. Agency for Healthcare Research and Quality guideline recommends that aspirin be taken indefinitely. Frequently, aspirin is combined with an ADP receptor inhibitor, such as clopidogrel, prasugrel, or ticagrelor to prevent blood clots. This is called dual antiplatelet therapy (DAPT). United States and European Union guidelines disagree somewhat about how long, and for what indications this combined therapy should be continued after surgery. U.S. guidelines recommend DAPT for at least 12 months, while EU guidelines recommend DAPT for 6–12 months after a drug-eluting stent placement. However, they agree that aspirin be continued indefinitely after DAPT is complete. Aspirin is thought to reduce the overall risk of both getting cancer and dying from cancer. This effect is particularly beneficial for colorectal cancer (CRC). It may also slightly reduce the risk of endometrial cancer, breast cancer, and prostate cancer. Some conclude the benefits are greater than the risks due to bleeding in those at average risk. Other are unclear if the benefits are greater than the risk. Given this uncertainty, the 2007 United States Preventive Services Task Force guidelines on this topic recommended against the use of aspirin for prevention of CRC in people with average risk. Aspirin is a first-line treatment for the fever and joint-pain symptoms of acute rheumatic fever. The therapy often lasts for one to two weeks, and is rarely indicated for longer periods. After fever and pain have subsided, the aspirin is no longer necessary, since it does not decrease the incidence of heart complications and residual rheumatic heart disease. Naproxen has been shown to be as effective as aspirin and less toxic, but due to the limited clinical experience, naproxen is recommended only as a second-line treatment. Along with rheumatic fever, Kawasaki disease remains one of the few indications for aspirin use in children in spite of a lack of high quality evidence for its effectiveness. Low-dose aspirin supplementation has moderate benefits when used for prevention of pre-eclampsia. For some people, aspirin does not have as strong an effect on platelets as for others, an effect known as aspirin-resistance or insensitivity. One study has suggested women are more likely to be resistant than men, and a different, aggregate study of 2,930 people found 28% were resistant. A study in 100 Italian people, though, found, of the apparent 31% aspirin-resistant subjects, only 5% were truly resistant, and the others were noncompliant. Another study of 400 healthy volunteers found no subjects who were truly resistant, but some had "pseudoresistance, reflecting delayed and reduced drug absorption". The 5-grain aspirin. The usage guidance label on a bottle of aspirin indicates that the dosage is "325 mg (5 gr)". Adult aspirin tablets are produced in standardised sizes, which vary slightly from country to country, for example 300 mg in Britain and 325 mg (or 5 grains) in the United States. Smaller doses are based on these standards, e.g., 75 mg and 81 mg tablets. The 81 mg (1 1⁄4-grain) tablets are commonly called "baby aspirin" or "baby-strength", because they were originally—but no longer—intended to be administered to infants and children. No medical significance occurs due to the slight difference in dosage between the 75 mg and the 81 mg tablets. In general, for adults, doses are taken four times a day for fever or arthritis, with doses near the maximal daily dose used historically for the treatment of rheumatic fever. For the prevention of myocardial infarction (MI) in someone with documented or suspected coronary artery disease, much lower doses are taken once daily. Recommendations from the USPSTF on the use of aspirin for the primary prevention of coronary heart disease encourage men aged 45–79 and women aged 55–79 to use aspirin when the potential benefit of a reduction in MI for men or stroke for women outweighs the potential harm of an increase in gastrointestinal hemorrhage. The WHI study said regular low dose (75 or 81 mg) aspirin female users had a 25% lower risk of death from cardiovascular disease and a 14% lower risk of death from any cause. Low-dose aspirin use was also associated with a trend toward lower risk of cardiovascular events, and lower aspirin doses (75 or 81 mg/day) may optimize efficacy and safety for people requiring aspirin for long-term prevention. In children with Kawasaki disease, aspirin is taken at dosages based on body weight, initially four times a day for up to two weeks and then at a lower dose once daily for a further six to eight weeks. Aspirin should not be taken by people who are allergic to ibuprofen or naproxen, or who have salicylate intolerance or a more generalized drug intolerance to NSAIDs, and caution should be exercised in those with asthma or NSAID-precipitated bronchospasm. Owing to its effect on the stomach lining, manufacturers recommend people with peptic ulcers, mild diabetes, or gastritis seek medical advice before using aspirin. Even if none of these conditions is present, the risk of stomach bleeding is still increased when aspirin is taken with alcohol or warfarin. People with hemophilia or other bleeding tendencies should not take aspirin or other salicylates. Aspirin is known to cause hemolytic anemia in people who have the genetic disease glucose-6-phosphate dehydrogenase deficiency, particularly in large doses and depending on the severity of the disease. Use of aspirin during dengue fever is not recommended owing to increased bleeding tendency. People with kidney disease, hyperuricemia, or gout should not take aspirin because it inhibits the kidneys' ability to excrete uric acid, thus may exacerbate these conditions. Aspirin should not be given to children or adolescents to control cold or influenza symptoms, as this has been linked with Reye's syndrome. Aspirin use has been shown to increase the risk of gastrointestinal bleeding. Although some enteric-coated formulations of aspirin are advertised as being "gentle to the stomach", in one study, enteric coating did not seem to reduce this risk. Combining aspirin with other NSAIDs has also been shown to further increase this risk. Using aspirin in combination with clopidogrel or warfarin also increases the risk of upper gastrointestinal bleeding. Blockade of COX-1 by aspirin apparently results in the upregulation of COX-2 as part of a gastric defense and that taking COX-2 inhibitors concurrently with aspirin increases the gastric mucosal erosion. Therefore, caution should be exercised if combining aspirin with any "natural" supplements with COX-2-inhibiting properties, such as garlic extracts, curcumin, bilberry, pine bark, ginkgo, fish oil, resveratrol, genistein, quercetin, resorcinol, and others. In addition to enteric coating, "buffering" is the other main method companies have used to try to mitigate the problem of gastrointestinal bleeding. Buffering agents are intended to work by preventing the aspirin from concentrating in the walls of the stomach, although the benefits of buffered aspirin are disputed. Almost any buffering agent used in antacids can be used; Bufferin, for example, uses magnesium oxide. Other preparations use calcium carbonate. Taking it with vitamin C is a more recently investigated method of protecting the stomach lining. Taking equal doses of vitamin C and aspirin may decrease the amount of stomach damage that occurs compared to taking aspirin alone. Large doses of salicylate, a metabolite of aspirin, cause temporary tinnitus (ringing in the ears) based on experiments in rats, via the action on arachidonic acid and NMDA receptors cascade. Reye's syndrome, a rare but severe illness characterized by acute encephalopathy and fatty liver, can occur when children or adolescents are given aspirin for a fever or other illness or infection. From 1981 through 1997, 1207 cases of Reye's syndrome in people younger than 18 were reported to the U.S. Centers for Disease Control and Prevention. Of these, 93% reported being ill in the three weeks preceding the onset of Reye's syndrome, most commonly with a respiratory infection, chickenpox, or diarrhea. Salicylates were detectable in 81.9% of children for whom test results were reported. After the association between Reye's syndrome and aspirin was reported, and safety measures to prevent it (including a Surgeon General's warning, and changes to the labeling of aspirin-containing drugs) were implemented, aspirin taken by children declined considerably in the United States, as did the number of reported cases of Reye's syndrome; a similar decline was found in the United Kingdom after warnings against pediatric aspirin use were issued. 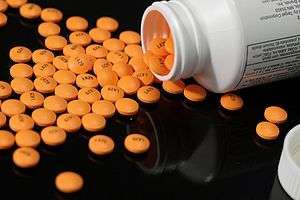 The U.S. Food and Drug Administration now recommends aspirin (or aspirin-containing products) should not be given to anyone under the age of 12 who has a fever, and the British Medicines and Healthcare products Regulatory Agency recommends children who are under 16 years of age should not take aspirin, unless it is on the advice of a doctor. For a small number of people, taking aspirin can result in symptoms resembling an allergic reaction, including hives, swelling, and headache. The reaction is caused by salicylate intolerance and is not a true allergy, but rather an inability to metabolize even small amounts of aspirin, resulting in an overdose. Aspirin and other NSAIDs, such as ibuprofen, may delay the healing of skin wounds. Aspirin may however help heal venous leg ulcers that have not healed following usual treatment. Aspirin can induce swelling of skin tissues in some people. In one study, angioedema appeared one to six hours after ingesting aspirin in some of the people. However, when the aspirin was taken alone, it did not cause angioedema in these people; the aspirin had been taken in combination with another NSAID-induced drug when angioedema appeared. Aspirin causes an increased risk of cerebral microbleeds having the appearance on MRI scans of 5 to 10 mm or smaller, hypointense (dark holes) patches. Such cerebral microbleeds are important, since they often occur prior to ischemic stroke or intracerebral hemorrhage, Binswanger disease, and Alzheimer's disease. A study of a group with a mean dosage of aspirin of 270 mg per day estimated an average absolute risk increase in intracerebral hemorrhage (ICH) of 12 events per 10,000 persons. In comparison, the estimated absolute risk reduction in myocardial infarction was 137 events per 10,000 persons, and a reduction of 39 events per 10,000 persons in ischemic stroke. In cases where ICH already has occurred, aspirin use results in higher mortality, with a dose of about 250 mg per day resulting in a relative risk of death within three months after the ICH around 2.5 (95% confidence interval 1.3 to 4.6). Aspirin and other NSAIDs can cause abnormally high blood levels of potassium by inducing a hyporeninemic hypoaldosteronic state via inhibition of prostaglandin synthesis; however, these agents do not typically cause hyperkalemia by themselves in the setting of normal renal function and euvolemic state. Aspirin can cause prolonged bleeding after operations for up to 10 days. In one study, 30 of 6499 people having elective surgery required reoperations to control bleeding. Twenty had diffuse bleeding and 10 had bleeding from a site. Diffuse, but not discrete, bleeding was associated with the preoperative use of aspirin alone or in combination with other NSAIDS in 19 of the 20 diffuse bleeding people. On 9 July 2015, the FDA toughened warnings of increased heart attack and stroke risk associated with nonsteroidal anti-inflammatory drugs (NSAID). Aspirin is an NSAID but is not affected by the new warnings. Aspirin overdose can be acute or chronic. In acute poisoning, a single large dose is taken; in chronic poisoning, higher than normal doses are taken over a period of time. Acute overdose has a mortality rate of 2%. Chronic overdose is more commonly lethal, with a mortality rate of 25%; chronic overdose may be especially severe in children. Toxicity is managed with a number of potential treatments, including activated charcoal, intravenous dextrose and normal saline, sodium bicarbonate, and dialysis. The diagnosis of poisoning usually involves measurement of plasma salicylate, the active metabolite of aspirin, by automated spectrophotometric methods. Plasma salicylate levels in general range from 30–100 mg/l after usual therapeutic doses, 50–300 mg/l in people taking high doses and 700–1400 mg/l following acute overdose. Salicylate is also produced as a result of exposure to bismuth subsalicylate, methyl salicylate, and sodium salicylate. Aspirin is known to interact with other drugs. For example, acetazolamide and ammonium chloride are known to enhance the intoxicating effect of salicylates, and alcohol also increases the gastrointestinal bleeding associated with these types of drugs. Aspirin is known to displace a number of drugs from protein-binding sites in the blood, including the antidiabetic drugs tolbutamide and chlorpropamide, warfarin, methotrexate, phenytoin, probenecid, valproic acid (as well as interfering with beta oxidation, an important part of valproate metabolism), and other NSAIDs. Corticosteroids may also reduce the concentration of aspirin. Ibuprofen can negate the antiplatelet effect of aspirin used for cardioprotection and stroke prevention. The pharmacological activity of spironolactone may be reduced by taking aspirin, and it is known to compete with penicillin G for renal tubular secretion. 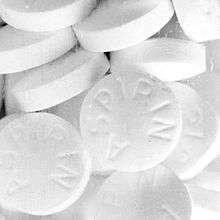 Aspirin may also inhibit the absorption of vitamin C.
Aspirin decomposes rapidly in solutions of ammonium acetate or the acetates, carbonates, citrates, or hydroxides of the alkali metals. It is stable in dry air, but gradually hydrolyses in contact with moisture to acetic and salicylic acids. In solution with alkalis, the hydrolysis proceeds rapidly and the clear solutions formed may consist entirely of acetate and salicylate. Like flour mills, factories that make aspirin tablets must pay attention to how much of the powder gets into the air inside the building, because the powder-air mixture can be explosive. The National Institute for Occupational Safety and Health (NIOSH) has set a recommended exposure limit in the United States of 5 mg/m3 (time-weighted average). In 1989, the Occupational Safety and Health Administration set a legal permissible exposure limit for aspirin of 5 mg/m3, but this was vacated by the AFL-CIO v. OSHA decision in 1993. The synthesis of aspirin is classified as an esterification reaction. Salicylic acid is treated with acetic anhydride, an acid derivative, causing a chemical reaction that turns salicylic acid's hydroxyl group into an ester group (R-OH → R-OCOCH3). This process yields aspirin and acetic acid, which is considered a byproduct of this reaction. Small amounts of sulfuric acid (and occasionally phosphoric acid) are almost always used as a catalyst. This method is commonly employed in undergraduate teaching labs. Formulations containing high concentrations of aspirin often smell like vinegar because aspirin can decompose through hydrolysis in moist conditions, yielding salicylic and acetic acids. Aspirin, an acetyl derivative of salicylic acid, is a white, crystalline, weakly acidic substance, with a melting point of 136 °C (277 °F), and a boiling point of 140 °C (284 °F). Its acid dissociation constant (pKa) is 3.5 at 25 °C (77 °F). Polymorphism, or the ability of a substance to form more than one crystal structure, is important in the development of pharmaceutical ingredients. Many drugs are receiving regulatory approval for only a single crystal form or polymorph. For a long time, only one crystal structure for aspirin was known. That aspirin might have a second crystalline form was suspected since the 1960s. The elusive second polymorph was first discovered by Vishweshwar and coworkers in 2005, and fine structural details were given by Bond et al. A new crystal type was found after attempted cocrystallization of aspirin and levetiracetam from hot acetonitrile. The form II is only stable at 100 K and reverts to form I at ambient temperature. In the (unambiguous) form I, two salicylic molecules form centrosymmetric dimers through the acetyl groups with the (acidic) methyl proton to carbonyl hydrogen bonds, and in the newly claimed form II, each salicylic molecule forms the same hydrogen bonds with two neighboring molecules instead of one. With respect to the hydrogen bonds formed by the carboxylic acid groups, both polymorphs form identical dimer structures. In 1971, British pharmacologist John Robert Vane, then employed by the Royal College of Surgeons in London, showed aspirin suppressed the production of prostaglandins and thromboxanes. For this discovery he was awarded the 1982 Nobel Prize in Physiology or Medicine, jointly with Sune Bergström and Bengt Ingemar Samuelsson. In 1984, he was made a Knight Bachelor. Aspirin's ability to suppress the production of prostaglandins and thromboxanes is due to its irreversible inactivation of the cyclooxygenase (COX; officially known as prostaglandin-endoperoxide synthase, PTGS) enzyme required for prostaglandin and thromboxane synthesis. Aspirin acts as an acetylating agent where an acetyl group is covalently attached to a serine residue in the active site of the PTGS enzyme. This makes aspirin different from other NSAIDs (such as diclofenac and ibuprofen), which are reversible inhibitors (Suicide inhibition). Low-dose aspirin use irreversibly blocks the formation of thromboxane A2 in platelets, producing an inhibitory effect on platelet aggregation during the lifetime of the affected platelet (8–9 days). This antithrombotic property makes aspirin useful for reducing the incidence of heart attacks in people who have had a heart attack, unstable angina, ischemic stroke or transient ischemic attack. 40 mg of aspirin a day is able to inhibit a large proportion of maximum thromboxane A2 release provoked acutely, with the prostaglandin I2 synthesis being little affected; however, higher doses of aspirin are required to attain further inhibition. Prostaglandins, local hormones produced in the body, have diverse effects, including the transmission of pain information to the brain, modulation of the hypothalamic thermostat, and inflammation. Thromboxanes are responsible for the aggregation of platelets that form blood clots. Heart attacks are caused primarily by blood clots, and low doses of aspirin are seen as an effective medical intervention for acute myocardial infarction. At least two different types of cyclooxygenases, COX-1 and COX-2, are acted on by aspirin. Aspirin irreversibly inhibits COX-1 and modifies the enzymatic activity of COX-2. COX-2 normally produces prostanoids, most of which are proinflammatory. Aspirin-modified PTGS2 produces lipoxins, most of which are anti-inflammatory. Newer NSAID drugs, COX-2 inhibitors (coxibs), have been developed to inhibit only PTGS2, with the intent to reduce the incidence of gastrointestinal side effects. However, several of the new COX-2 inhibitors, such as rofecoxib (Vioxx), have been withdrawn in the last decade, after evidence emerged that PTGS2 inhibitors increase the risk of heart attack and stroke. Endothelial cells lining the microvasculature in the body are proposed to express PTGS2, and, by selectively inhibiting PTGS2, prostaglandin production (specifically, PGI2; prostacyclin) is downregulated with respect to thromboxane levels, as PTGS1 in platelets is unaffected. Thus, the protective anticoagulative effect of PGI2 is removed, increasing the risk of thrombus and associated heart attacks and other circulatory problems. Since platelets have no DNA, they are unable to synthesize new PTGS once aspirin has irreversibly inhibited the enzyme, an important difference with reversible inhibitors. Furthermore, aspirin, while inhibiting the ability of COX-2 to form pro-inflammatory products such as the prostaglandins, converts this enzyme's activity from a prostaglandin-forming cyclooxygenase to a lipoxygenase-like enzyme: aspirin-treated COX-2 metabolizes a variety of polyunsaturated fatty acids to hydroperoxy products which are then further metabolized to specialized proresolving mediators such as the aspirin-triggered lipoxins, aspirin-triggered resolvins, and aspirin-triggered maresins. These mediators possess potent anti-inflammatory activity. It is proposed that this aspirin-triggered transition of COX-2 from cyclooxygenase to lipoxygenase activity and the consequential formation of specialized proresolving mediators contributes to the anti-inflammatory effects of aspirin. Aspirin has been shown to have at least three additional modes of action. It uncouples oxidative phosphorylation in cartilaginous (and hepatic) mitochondria, by diffusing from the inner membrane space as a proton carrier back into the mitochondrial matrix, where it ionizes once again to release protons. Aspirin buffers and transports the protons. When high doses are given, it may actually cause fever, owing to the heat released from the electron transport chain, as opposed to the antipyretic action of aspirin seen with lower doses. In addition, aspirin induces the formation of NO-radicals in the body, which have been shown in mice to have an independent mechanism of reducing inflammation. This reduced leukocyte adhesion is an important step in the immune response to infection; however, evidence is insufficient to show aspirin helps to fight infection. More recent data also suggest salicylic acid and its derivatives modulate signaling through NF-κB. NF-κB, a transcription factor complex, plays a central role in many biological processes, including inflammation. Aspirin is readily broken down in the body to salicylic acid, which itself has anti-inflammatory, antipyretic, and analgesic effects. In 2012, salicylic acid was found to activate AMP-activated protein kinase, which has been suggested as a possible explanation for some of the effects of both salicylic acid and aspirin. The acetyl portion of the aspirin molecule has its own targets. Acetylation of cellular proteins is a well-established phenomenon in the regulation of protein function at the post-translational level. Aspirin is able to acetylate several other targets in addition to COX isoenzymes. These acetylation reactions may explain many hitherto unexplained effects of aspirin. Acetylsalicylic acid is a weak acid, and very little of it is ionized in the stomach after oral administration. Acetylsalicylic acid is quickly absorbed through the cell membrane in the acidic conditions of the stomach. The increased pH and larger surface area of the small intestine causes aspirin to be absorbed more slowly there, as more of it is ionised. Owing to the formation of concretions, aspirin is absorbed much more slowly during overdose, and plasma concentrations can continue to rise for up to 24 hours after ingestion. About 50–80% of salicylate in the blood is bound to albumin protein, while the rest remains in the active, ionized state; protein binding is concentration-dependent. Saturation of binding sites leads to more free salicylate and increased toxicity. The volume of distribution is 0.1–0.2 l/kg. Acidosis increases the volume of distribution because of enhancement of tissue penetration of salicylates. As much as 80% of therapeutic doses of salicylic acid is metabolized in the liver. Conjugation with glycine forms salicyluric acid, and with glucuronic acid to form two different glucuronide esters. The conjugate with the acetyl group intact is referred to as the acyl glucuronide; the deacetylated conjugate is the phenolic glucuronide. These metabolic pathways have only a limited capacity. Small amounts of salicylic acid are also hydroxylated to gentisic acid. With large salicylate doses, the kinetics switch from first-order to zero-order, as metabolic pathways become saturated and renal excretion becomes increasingly important. Salicylates are excreted mainly by the kidneys as salicyluric acid (75%), free salicylic acid (10%), salicylic phenol (10%), and acyl glucuronides (5%), gentisic acid (< 1%), and 2,3-dihydroxybenzoic acid. When small doses (less than 250 mg in an adult) are ingested, all pathways proceed by first-order kinetics, with an elimination half-life of about 2.0 to 4.5 hours. When higher doses of salicylate are ingested (more than 4 g), the half-life becomes much longer (15–30 hours), because the biotransformation pathways concerned with the formation of salicyluric acid and salicyl phenolic glucuronide become saturated. Renal excretion of salicylic acid becomes increasingly important as the metabolic pathways become saturated, because it is extremely sensitive to changes in urinary pH. A 10- to 20-fold increase in renal clearance occurs when urine pH is increased from 5 to 8. The use of urinary alkalinization exploits this particular aspect of salicylate elimination. In 1853, chemist Charles Frédéric Gerhardt treated acetyl chloride with sodium salicylate to produce acetylsalicylic acid for the first time;:46-48 in the second half of the nineteenth century, other academic chemists established the compound's chemical structure and devised more efficient methods of synthesis. In 1897, scientists at the drug and dye firm Bayer began investigating acetylsalicylic acid as a less-irritating replacement for standard common salicylate medicines, and identified a new way to synthesize it. :69-75 By 1899, Bayer had dubbed this drug Aspirin and was selling it around the world. :27 The word Aspirin was Bayer's brand name, rather than the generic name of the drug; however, Bayer's rights to the trademark were lost or sold in many countries. Aspirin's popularity grew over the first half of the twentieth century leading to fierce competition with the proliferation of aspirin brands and products. Due to allowing the use of "Aspirin" for years by other manufacturing chemists, despite the trademark-infringing nature of the use, and its own failure to use the name for its own product when it began selling direct, Bayer lost its trademark in the United States in 1918, affirmed by court appeal in 1921. Today, aspirin is a generic word in Australia, France, India, Ireland, New Zealand, Pakistan, Jamaica, Colombia, the Philippines, South Africa, Ghana, the United Kingdom and the United States. Aspirin, with a capital "A", remains a registered trademark of Bayer in Germany, Canada, Mexico, and in over 80 other countries, where the trademark is owned by Bayer, using acetylsalicylic acid in all markets, but using different packaging and physical aspects for each. Aspirin is the British Approved Name (BAN) and United States Adopted Name (USAN). Aspirin is sometimes used for pain relief or as an anticoagulant in veterinary medicine, primarily in dogs and sometimes horses, although newer medications with fewer side effects are generally used instead. Both dogs and horses are susceptible to the gastrointestinal side effects associated with salicylates, but it is a convenient treatment for arthritis in older dogs, and has shown some promise in cases of laminitis in horses. It is no longer commonly used for cases of laminitis, as it could be counterproductive for treatment. Aspirin should be used in animals only under the direct supervision of a veterinarian; in particular, cats lack the glucuronide conjugates that aid in the excretion of aspirin, making it potentially toxic. No clinical signs of toxicosis occurred when cats were given 25 mg/kg of aspirin every 48 hours for 4 weeks. The dose recommended in cats for relief of pain and fever is 10 mg/kg every 48 hours. 1 2 "Zorprin, Bayer Buffered Aspirin (aspirin) dosing, indications, interactions, adverse effects, and more". Medscape Reference. WebMD. Retrieved 3 April 2014. 1 2 3 Brayfield, A, ed. (14 January 2014). "Aspirin". Martindale: The Complete Drug Reference. Pharmaceutical Press. Retrieved 3 April 2014. 1 2 3 4 "Aspirin". Drugs.com. American Society of Health-System Pharmacists. June 6, 2016. Retrieved 30 August 2016. ↑ Patrignani, P; Patrono, C (30 August 2016). "Aspirin and Cancer.". Journal of the American College of Cardiology. 68 (9): 967–76. PMID 27561771. 1 2 Jones, Alan (2015). Chemistry: An Introduction for Medical and Health Sciences. John Wiley & Sons. pp. 5–6. ISBN 9780470092903. 1 2 3 4 "Aspirin". Chemical & Engineering News. Retrieved 2007-08-13. 1 2 Warner, T D; Warner TD, Mitchell JA (2002). "Cyclooxygenase-3 (COX-3): filling in the gaps toward a COX continuum?". Proceedings of the National Academy of Sciences of the United States of America. 99 (21): 13371–3. doi:10.1073/pnas.222543099. PMC 129677 . PMID 12374850. 1 2 "Aspirin". The American Society of Health-System Pharmacists. Retrieved 3 April 2011. ↑ "Aspirin for reducing your risk of heart attack and stroke: know the facts". U.S. Food and Drug Administration. Retrieved 26 July 2012. ↑ "Aspirin for the prevention of cardiovascular disease". U.S. Preventive Services Task Force. Retrieved 26 July 2012. ↑ Seshasai, SR; Wijesuriya, S; Sivakumaran, R; Nethercott, S; Erqou, S; Sattar, N; Ray, KK (13 February 2012). "Effect of aspirin on vascular and nonvascular outcomes: meta-analysis of randomized controlled trials". Archives of Internal Medicine. 172 (3): 209–16. doi:10.1001/archinternmed.2011.628. PMID 22231610. 1 2 Algra, AM; Rothwell, PM (May 2012). "Effects of regular aspirin on long-term cancer incidence and metastasis: a systematic comparison of evidence from observational studies versus randomised trials". The Lancet Oncology. 13 (5): 518–27. doi:10.1016/S1470-2045(12)70112-2. PMID 22440112. ↑ Bibbins-Domingo, K; U.S. Preventive Services Task, Force (21 June 2016). "Aspirin use for the primary prevention of cardiovascular disease and colorectal cancer: U.S. Preventive Services Task Force recommendation statement". Annals of Internal Medicine. 164 (12): 836–45. PMID 27064677. ↑ Sachs, CJ (2005). "Oral analgesics for acute nonspecific pain". American Family Physician. 71 (5): 913–918. PMID 15768621. ↑ Gaciong (2003). "The real dimension of analgesic activity of aspirin". Thrombosis Research. 110 (5–6): 361–364. doi:10.1016/j.thromres.2003.08.009. PMID 14592563. ↑ Derry, CJ; Derry, S; Moore, RA (2012). Derry, Sheena, ed. "Caffeine as an analgesic adjuvant for acute pain in adults". Cochrane database of systematic reviews. 3: CD009281. doi:10.1002/14651858.CD009281.pub2. PMID 22419343. ↑ "Blowfish (aspirin, caffeine) tablet, effervescent [Rally Labs LLC]". DailyMed. U.S. Federal Drug Administration. Retrieved 27 July 2012. ↑ Hersh, E; Moore, P; Ross, G (2000). "Over-the-counter analgesics and antipyretics: A critical assessment". Clinical Therapeutics. 22 (5): 500–548. doi:10.1016/S0149-2918(00)80043-0. PMID 10868553. ↑ Mett, A; Tfelt-Hansen, P (2008). "Acute migraine therapy: recent evidence from randomized comparative trials". Current Opinion in Neurology. 21 (3): 331–337. doi:10.1097/WCO.0b013e3282fee843. PMID 18451718. ↑ Kingery, WS (November 1997). "A critical review of controlled clinical trials for peripheral neuropathic pain and complex regional pain syndromes". Pain. 73 (2): 123–39. doi:10.1016/S0304-3959(97)00049-3. PMID 9415498. ↑ Loder, E; Rizzoli, P (12 January 2008). "Tension-type headache". BMJ (Clinical research ed.). 336 (7635): 88–92. doi:10.1136/bmj.39412.705868.AD. PMC 2190284 . PMID 18187725. ↑ Gilmore, B; Michael, M (1 February 2011). "Treatment of acute migraine headache". American family physician. 83 (3): 271–80. PMID 21302868. ↑ Bartfai, T; Conti, B (16 March 2010). "Fever". The Scientific World Journal. 10: 490–503. doi:10.1100/tsw.2010.50. PMC 2850202 . PMID 20305990. ↑ Pugliese, A; Beltramo, T; Torre, D (October 2008). "Reye's and Reye's-like syndromes". Cell biochemistry and function. 26 (7): 741–6. doi:10.1002/cbf.1465. PMID 18711704. ↑ Beutler, AI; Chesnut, GT; Mattingly, JC; Jamieson, B (15 December 2009). "FPIN's Clinical Inquiries. Aspirin use in children for fever or viral syndromes". American family physician. 80 (12): 1472. PMID 20000310. ↑ "Medications Used to Treat Fever". American Academy of Pediatrics. Retrieved 25 November 2012. ↑ "51 FR 8180" (PDF). United States Federal Register. 51 (45). 7 March 1986. Retrieved 25 November 2012. ↑ "Myocardial infarction with ST-segment elevation: the acute management of myocardial infarction with ST-segment elevation [Internet]". NICE Clinical Guidelines (167). 17.2 Asprin. July 2013. PMID 25340241. 1 2 Quaas, Joshua (November 28, 2009). "Aspirin given immediately for a major heart attack (STEMI)". The NNT. Retrieved 10 August 2016. ↑ Newman, David (July 10, 2011). "Aspirin to prevent cardiovascular disease in people with known heart disease or strokes". The NNT. Retrieved 30 November 2015. ↑ Hall, SL; Lorenc, T (1 February 2010). "Secondary prevention of coronary artery disease". American family physician. 81 (3): 289–96. PMID 20112887. ↑ Baigent, C; Blackwell, L; Collins, R; Emberson, J; Godwin, J; Peto, R; Buring, J; Hennekens, C; Kearney, P; Meade, T; Patrono, C; Roncaglioni, MC; Zanchetti, A (2009). "Aspirin in the primary and secondary prevention of vascular disease: collaborative meta-analysis of individual participant data from randomised trials". The Lancet. 373 (9678): 1849–60. doi:10.1016/S0140-6736(09)60503-1. PMC 2715005 . PMID 19482214. ↑ Antithrombotic Trialists' Collaboration (ATT); Baigent, C; Blackwell, L; Collins, R; Emberson, J; Godwin, J; Peto, R; Buring, J; Hennekens, C; Kearney, P; Meade, T; Patrono, C; Roncaglioni, MC; Zanchetti, A (30 May 2009). "Aspirin in the primary and secondary prevention of vascular disease: collaborative meta-analysis of individual participant data from randomised trials". The Lancet. 373 (9678): 1849–60. doi:10.1016/s0140-6736(09)60503-1. PMC 2715005 . PMID 19482214. ↑ Newman, David (January 8, 2015). "Aspirin to prevent a first heart attack or stroke". theNNT. Retrieved 30 November 2015. ↑ Wolff, T; Miller, T; Ko, S (17 March 2009). "Aspirin for the primary prevention of cardiovascular events: an update of the evidence for the U.S. Preventive Services Task Force". Annals of Internal Medicine. 150 (6): 405–10. doi:10.7326/0003-4819-150-6-200903170-00009. PMID 19293073. ↑ U.S. Preventive Services Task Force. "Aspirin for the Prevention of Cardiovascular Disease: recommendation statement". Retrieved 15 August 2012. ↑ Berger, JS; Lala, A; Krantz, MJ; Baker, GS; Hiatt, WR (July 2011). "Aspirin for the prevention of cardiovascular events in patients without clinical cardiovascular disease: a meta-analysis of randomized trials". American Heart Journal. 162 (1): 115–24.e2. doi:10.1016/j.ahj.2011.04.006. PMID 21742097. ↑ Norris, JW (September 2005). "Antiplatelet agents in secondary prevention of stroke: a perspective". Stroke: a journal of cerebral circulation. 36 (9): 2034–6. doi:10.1161/01.STR.0000177887.14339.46. PMID 16100022. ↑ Sleight, P; Pouleur, H; Zannad, F (July 2006). "Benefits, challenges, and registerability of the polypill". European Heart Journal. 27 (14): 1651–6. doi:10.1093/eurheartj/ehi841. PMID 16603580. ↑ Wang, TH; Bhatt, DL; Topol, EJ (March 2006). "Aspirin and clopidogrel resistance: an emerging clinical entity". European Heart Journal. 27 (6): 647–54. doi:10.1093/eurheartj/ehi684. PMID 16364973. ↑ Oliveira, DC; Silva, RF; Silva, DJ; Lima, VC (September 2010). "Aspirin resistance: fact or fiction?". Arquivos brasileiros de cardiologia. 95 (3): e91–4. doi:10.1590/S0066-782X2010001300024. PMID 20944898. ↑ Topçuoglu, MA; Arsava, EM; Ay, H (February 2011). "Antiplatelet resistance in stroke". Expert Review of Neurotherapeutics. 11 (2): 251–63. doi:10.1586/ern.10.203. PMC 3086673 . PMID 21306212. ↑ Ben-Dor, I; Kleiman, NS; Lev, E (15 July 2009). "Assessment, mechanisms, and clinical implication of variability in platelet response to aspirin and clopidogrel therapy". American Journal of Cardiology. 104 (2): 227–33. doi:10.1016/j.amjcard.2009.03.022. PMID 19576352. ↑ National Guideline Clearinghouse (NGC). "2011 ACCF/AHA/SCAI guideline for percutaneous coronary artery intervention. A report of the American College of Cardiology Foundation/American Heart Association Task Force on Practice Guidelines and the Society for Cardiovascular Angiography and Interventions". United States Agency for Healthcare Research and Quality (AHRQ). Retrieved 28 August 2012. ↑ Musumeci, G; Di Lorenzo, E; Valgimigli, M (December 2011). "Dual antiplatelet therapy duration: what are the drivers?". Current Opinion in Cardiology. 26 Suppl 1: S4–14. doi:10.1097/01.hco.0000409959.11246.ba. PMID 22129582. 1 2 Cuzick, J; Thorat, MA; Bosetti, C; Brown, PH; Burn, J; Cook, NR; Ford, LG; Jacobs, EJ; Jankowski, JA; La Vecchia, C; Law, M; Meyskens, F; Rothwell, PM; Senn, HJ; Umar, A (5 August 2014). "Estimates of benefits and harms of prophylactic use of aspirin in the general population". Annals of Oncology. 26: 47–57. doi:10.1093/annonc/mdu225. PMID 25096604. ↑ Manzano, A; Pérez-Segura, P (29 April 2012). "Colorectal cancer chemoprevention: is this the future of colorectal cancer prevention?". The Scientific World Journal. 2012: 327341. doi:10.1100/2012/327341. PMC 3353298 . PMID 22649288. ↑ Chan, AT; Arber, N; Burn, J; Chia, WK; Elwood, P; Hull, MA; Logan, RF; Rothwell, PM; Schrör, K; Baron, JA (February 2012). "Aspirin in the chemoprevention of colorectal neoplasia: an overview". Cancer Prevention Research (Philadelphia, PA). 5 (2): 164–78. doi:10.1158/1940-6207.CAPR-11-0391. PMC 3273592 . PMID 22084361. ↑ Thun, MJ; Jacobs, EJ; Patrono, C (3 April 2012). "The role of aspirin in cancer prevention". Nature Reviews Clinical Oncology. 9 (5): 259–67. doi:10.1038/nrclinonc.2011.199. PMID 22473097. ↑ Verdoodt, F; Friis, S; Dehlendorff, C; Albieri, V; Kjaer, SK (February 2016). "Non-steroidal anti-inflammatory drug use and risk of endometrial cancer: a systematic review and meta-analysis of observational studies". Gynecologic Oncology. 140 (2): 352–8. doi:10.1016/j.ygyno.2015.12.009. PMID 26701413. ↑ Bosetti, C; Rosato, V; Gallus, S; Cuzick, J; La Vecchia, C (19 April 2012). "Aspirin and cancer risk: a quantitative review to 2011". Annals of Oncology. 23 (6): 1403–1415. doi:10.1093/annonc/mds113. PMID 22517822. ↑ Sutcliffe, P; Connock, M; Gurung, T; Freeman, K; Johnson, S; Kandala, NB; Grove, A; Gurung, B; Morrow, S; Clarke, A (September 2013). "Aspirin for prophylactic use in the primary prevention of cardiovascular disease and cancer: a systematic review and overview of reviews". Health Technology Assessment (Winchester, England). 17 (43): 1–253. doi:10.3310/hta17430. PMID 24074752. ↑ Kim, SE (2014). "The benefit-risk consideration in long-term use of alternate-day, low dose aspirin: focus on colorectal cancer prevention". Annals of Gastroenterology. 27 (1): 87–88. PMID 24714632. ↑ U.S. Preventive Services Task, Force (6 March 2007). "Routine aspirin or nonsteroidal anti-inflammatory drugs for the primary prevention of colorectal cancer: U.S. Preventive Services Task Force recommendation statement". Annals of Internal Medicine. 146 (5): 361–4. doi:10.7326/0003-4819-146-5-200703060-00008. PMID 17339621. 1 2 National Heart Foundation of Australia (RF/RHD guideline development working group) and the Cardiac Society of Australia and New Zealand (2006). "Diagnosis and management of acute rheumatic fever and rheumatic heart disease in Australia. An evidence-based review" (PDF). National Heart Foundation of Australia. pp. 33–37. Archived from the original (PDF) on 2008-07-26. Retrieved 9 May 2011. ↑ Working Group on Pediatric Acute Rheumatic Fever and Cardiology Chapter of Indian Academy of Pediatrics; Saxena, A; Kumar, RK; Gera, RP; Radhakrishnan, S; Mishra, S; Ahmed, Z (July 2008). "Consensus guidelines on pediatric acute rheumatic fever and rheumatic heart disease". Indian Pediatrics. 45 (7): 565–73. PMID 18695275. ↑ Hashkes; Tauber, T; Somekh, E; Brik, R; Barash, J; Mukamel, M; Harel, L; Lorber, A; Berkovitch, M; Uziel, Y; Pediatric Rheumatlogy Study Group of Israel (2003). "Naproxen as an alternative to aspirin for the treatment of arthritis of rheumatic fever: a randomized trial". The Journal of Pediatrics. 143 (3): 399–401. doi:10.1067/S0022-3476(03)00388-3. PMID 14517527. ↑ Rowley, AH; Shulman, ST (February 2010). "Pathogenesis and management of Kawasaki disease". Expert review of anti-infective therapy. 8 (2): 197–203. doi:10.1586/eri.09.109. PMC 2845298 . PMID 20109049. ↑ Baumer, JH; Love, SJ; Gupta, A; Haines, LC; Maconochie, I; Dua, JS (18 October 2006). Baumer, J Harry, ed. "Salicylate for the treatment of Kawasaki disease in children". Cochrane Database of Systematic Reviews (4): CD004175. doi:10.1002/14651858.CD004175.pub2. PMID 17054199. ↑ Duley, L; Henderson-Smart, DJ; Meher, S; King, JF (2007). Duley, Lelia, ed. "Antiplatelet agents for preventing pre-eclampsia and its complications". Cochrane Database of Systematic Reviews (2): CD004659. doi:10.1002/14651858.CD004659.pub2. PMID 17443552. ↑ Roberge, SP; Villa, P; Nicolaides, K; Giguère, Y; Vainio, M; Bakthi, A; Ebrashy, A; Bujold, E (2012). "Early administration of low-dose aspirin for the prevention of preterm and term preeclampsia: a systematic review and meta-analysis". Fetal Diagnosis and Therapy. 31 (3): 141–146. doi:10.1159/000336662. PMID 22441437. ↑ Dorsch MP, Lee JS, Lynch DR, Dunn SP, Rodgers JE, Schwartz T, Colby E, Montague D, Smyth SS (2007). "Aspirin resistance in patients with stable coronary artery disease with and without a history of myocardial infarction". Annals of Pharmacotherapy. 41 (May): 737–41. doi:10.1345/aph.1H621. PMID 17456544. ↑ Krasopoulos G, Brister SJ, Beattie WS, Buchanan MR (2008). "Aspirin "resistance" and risk of cardiovascular morbidity: systematic review and meta-analysis". The BMJ. 336 (7637): 195–8. doi:10.1136/bmj.39430.529549.BE. PMC 2213873 . PMID 18202034. ↑ Pignatelli P, Di Santo S, Barillà F, Gaudio C, Violi F (2008). "Multiple anti-atherosclerotic treatments impair aspirin compliance: effects on aspirin resistance". Journal of Thrombosis and Haemostasis. 6 (10): 1832–4. doi:10.1111/j.1538-7836.2008.03122.x. PMID 18680540. ↑ Grosser, Tilo; Fries, Susanne; Lawson, John A; Kapoor, Shiv C; Grant, Gregory R; FitzGerald, Garret A (2013). "Drug resistance and pseudoresistance: an unintended consequence of enteric coating aspirin". Circulation (published 4 December 2012). 127 (3): 377–85. doi:10.1161/CIRCULATIONAHA.112.117283. PMC 3552520 . PMID 23212718. Lay summary – The New York Times (4 December 2012). ↑ "Invention of the safety cap". digitaldukemed.mc.duke.edu. Retrieved 2015-09-04. 1 2 British National Formulary (45 ed.). British Medical Journal and Royal Pharmaceutical Society of Great Britain. 2003. ↑ "Aspirin monograph: dosages, etc". Medscape.com. Retrieved 11 May 2011. 1 2 3 "Aspirin: more evidence that low dose is all that is needed". Medscape CME. Retrieved 11 May 2011. ↑ British National Formulary for Children. British Medical Journal and Royal Pharmaceutical Society. 2006. 1 2 3 4 5 "Aspirin information from Drugs.com". Drugs.com. Archived from the original on 9 May 2008. Retrieved 8 May 2008. 1 2 3 "Oral Aspirin information". First DataBank. Retrieved 8 May 2008. ↑ Raithel, M; Baenkler, HW; Naegel, A; Buchwald, F; Schultis, HW; Backhaus, B; Kimpel, S; Koch, H; Mach, K; Hahn, EG; Konturek, PC (2005). "Significance of salicylate intolerance in diseases of the lower gastrointestinal tract" (PDF). Journal of Physiology and Pharmacology. 56 (Suppl 5): 89–102. PMID 16247191. ↑ Senna GE, Andri G, Dama AR, Mezzelani P, Andri L (1995). "Tolerability of imidazole salycilate in aspirin-sensitive patients". Allergy Proc. 16 (5): 251–4. doi:10.2500/108854195778702675. PMID 8566739. 1 2 "PDR guide to over the counter (OTC) drugs". Archived from the original on 10 April 2008. Retrieved 28 April 2008. ↑ Livingstone, Frank B (1985). Frequencies of hemoglobin variants: thalassemia, the glucose-6-phosphate dehydrogenase deficiency, G6PD variants, and ovalocytosis in human populations. Oxford University Press. ISBN 0-19-503634-4. ↑ "Dengue and dengue hemorrhagic fever: information for health care practitioners". Archived from the original on 17 March 2008. Retrieved 28 April 2008. 1 2 Macdonald S (2002). "Aspirin use to be banned in under 16-year olds". BMJ. 325 (7371): 988c–988. doi:10.1136/bmj.325.7371.988/c. PMC 1169585 . PMID 12411346. 1 2 3 Sørensen HT; Mellemkjaer L; Blot WJ; Nielsen, Gunnar Lauge; Steffensen, Flemming Hald; McLaughlin, Joseph K.; Olsen, Jorgen H. (2000). "Risk of upper gastrointestinal bleeding associated with use of low-dose aspirin". Am. J. Gastroenterol. 95 (9): 2218–24. doi:10.1111/j.1572-0241.2000.02248.x. PMID 11007221. ↑ Delaney JA; Opatrny L; Brophy JM; Suissa S (2007). "Drug–drug interactions between antithrombotic medications and the risk of gastrointestinal bleeding". CMAJ. 177 (4): 347–51. doi:10.1503/cmaj.070186. PMC 1942107 . PMID 17698822. ↑ Wallace, JL (2008). "Prostaglandins, NSAIDs, and gastric mucosal protection: why doesn't the stomach digest itself?". Physiological Reviews. 88 (4): 1547–1565. doi:10.1152/physrev.00004.2008. PMID 18923189. ↑ Fiorucci, S; Santucci, L; Wallace, JL; Sardina, M; Romano, M; Del Soldato, P; Morelli, A (2003). "Interaction of a selective cyclooxygenase-2 inhibitor with aspirin and NO-releasing aspirin in the human gastric mucosa". Proceedings of the National Academy of Sciences. 100 (19): 10937–10941. doi:10.1073/pnas.1933204100. PMC 196906 . PMID 12960371. ↑ "General chemistry online: FAQ: Acids and bases: What is the buffer system in buffered aspirin?". Antoine.frostburg.edu. Retrieved 11 May 2011. ↑ Dammann, HG; Saleki, M; Torz, M; Schulz, HU; Krupp, S; Schürer, M; Timm, J; Gessner, U (2004). "Effects of buffered and plain acetylsalicylic acid formulations with and without ascorbic acid on gastric mucosa in healthy subjects". Alimentary Pharmacology & Therapeutics. 19 (3): 367–374. doi:10.1111/j.1365-2036.2004.01742.x. PMID 14984384. ↑ Konturek; Kania, J; Hahn, EG; Konturek, JW (2006). "Ascorbic acid attenuates aspirin-induced gastric damage: role of inducible nitric oxide synthase". Journal of Physiology and Pharmacology. 57 Suppl 5 (5): 125–36. PMID 17218764. ↑ Guitton MJ, Caston J, Ruel J, Johnson RM, Pujol R, Puel JL (2003). "Salicylate induces tinnitus through activation of cochlear NMDA receptors". The Journal of Neuroscience. 23 (9): 3944–52. PMID 12736364. 1 2 Belay ED, Bresee JS, Holman RC, Khan AS, Shahriari A, Schonberger LB (1999). "Reye's syndrome in the United States from 1981 through 1997". New England Journal of Medicine. 340 (18): 1377–82. doi:10.1056/NEJM199905063401801. PMID 10228187. ↑ "Reye's syndrome". NHS Choices. National Health Service. Retrieved 10 August 2016. ↑ Stadelmann, WK; Digenis, AG; Tobin, GR (August 1998). "Impediments to wound healing.". American journal of surgery. 176 (2A Suppl): 39S–47S. PMID 9777971. ↑ Maessen-Visch, MB; de Roos, KP (19 May 2014). "Dutch venous ulcer guideline update". Phlebology / Venous Forum of the Royal Society of Medicine. 29 (1 suppl): 153–156. doi:10.1177/0268355514529693. PMID 24843102. ↑ Berges-Gimeno MP, Stevenson DD (2004). "Nonsteroidal anti-inflammatory drug-induced reactions and desensitization". Journal of Asthma. 41 (4): 375–84. doi:10.1081/JAS-120037650. PMID 15281324. ↑ Vernooij MW, Haag MD, der Lugt A, Hofman A, Krestin GP, Stricker BH, Breteler MM (2009). "Use of antithrombotic drugs and the presence of cerebral microbleeds: the Rotterdam scan study". Archives of Neurology. 66 (6): 714–20. doi:10.1001/archneurol.2009.42. PMID 19364926. ↑ Gorelick PB (2009). "Cerebral microbleeds: evidence of heightened risk associated with aspirin use". Archives of Neurology. 66 (6): 691–3. doi:10.1001/archneurol.2009.85. PMID 19506128. 1 2 He, J; Whelton, PK; Vu, B; Klag, MJ (1998). "Aspirin and risk of hemorrhagic stroke: A meta-analysis of randomized controlled trials". JAMA: the Journal of the American Medical Association. 280 (22): 1930–1935. doi:10.1001/jama.280.22.1930. PMID 9851479. ↑ Saloheimo, P; Ahonen, M; Juvela, S; Pyhtinen, J; Savolainen, ER; Hillbom, M (January 2006). "Regular aspirin-use preceding the onset of primary intracerebral hemorrhage is an independent predictor for death". Stroke. 37 (1): 129–133. doi:10.1161/01.STR.0000196991.03618.31. PMID 16322483. ↑ Scher, KS (1996). "Unplanned reoperation for bleeding". American Surgeon. 62 (1): 52–55. PMID 8540646. ↑ Staff (9 July 2015). "FDA strengthens warning of heart attack and stroke risk for non-steroidal anti-inflammatory drugs". FDA. Retrieved 9 July 2015. ↑ Kreplick, LW (2001). "Salicylate toxicity in emergency medicine". Medscape. ↑ Marx, John (2006). Rosen's emergency medicine: concepts and clinical practice. Mosby/Elsevier. p. 2242. ISBN 978-0-323-02845-5. ↑ Morra P, Bartle WR, Walker SE, Lee SN, Bowles SK, Reeves RA (1996). "Serum concentrations of salicylic acid following topically applied salicylate derivatives". Annals of Pharmacotherapy. 30 (9): 935–40. PMID 8876850. ↑ R. Baselt (2011). Disposition of toxic drugs and chemicals in man (9th ed.). Seal Beach, California: Biomedical Publications. pp. 20–23. ↑ "Information for Healthcare Professionals: Concomitant Use of Ibuprofen and Aspirin". FDA. U.S. Department of Health & Human Services. September 2006. Archived from the original on 13 November 2010. Retrieved 22 November 2010. ↑ Katzung (1998). Basic and clinical pharmacology. McGraw-Hill. p. 584. ↑ Loh HS; Watters K; Wilson CW (1 November 1973). "The effects of aspirin on the metabolic availability of ascorbic acid in human beings". Journal of Clinical Pharmacology. 13 (11): 480–6. doi:10.1002/j.1552-4604.1973.tb00203.x. PMID 4490672. ↑ Basu TK (1982). "Vitamin C-aspirin interactions". Internationale Zeitschrift für Vitamin- und Ernährungsforschung. Supplement to the International Journal for Vitamin and Nutrition Research. 23: 83–90. PMID 6811490. ↑ Ioannides C; Stone AN; Breacker PJ; Basu TK (1982). "Impairment of absorption of ascorbic acid following ingestion of aspirin in guinea pigs". Biochemical Pharmacology. 31 (24): 4035–8. doi:10.1016/0006-2952(82)90652-9. PMID 6818974. ↑ EF Reynolds, ed. (1982). "Aspirin and similar analgesic and anti-inflammatory agents". Martindale: the extra pharmacopoeia (28th ed.). pp. 234–82. ↑ "Acetylsalicylic acid". Pocket Guide to chemical hazards. U.S. National Institute for Occupational Safety and Health. February 13, 2015. ↑ "Appendix G: 1989 Air contaminants update project - Exposure limits NOT in effect". NIOSH pocket guide to chemical hazards. National Institute for Occupational Safety and Health. February 13, 2015. ↑ Palleros, Daniel R (2000). Experimental organic chemistry. New York: John Wiley & Sons. p. 494. ISBN 0-471-28250-2. ↑ Barrans, Richard. "Aspirin aging". Newton BBS. Archived from the original on 18 May 2008. Retrieved 8 May 2008. ↑ Carstensen, JT; F Attarchi; XP Hou (1985). "Decomposition of aspirin in the solid state in the presence of limited amounts of moisture". Journal of Pharmaceutical Sciences. 77 (4): 318–21. doi:10.1002/jps.2600770407. PMID 3379589. ↑ Richard Leroy Myers (30 August 2007). The 100 most important chemical compounds: a reference guide. ABC-CLIO. p. 10. ISBN 978-0-313-33758-1. Retrieved 18 November 2012. ↑ "Acetylsalicylic acid". Jinno Laboratory, School of Materials Science, Toyohashi University of Technology. 4 March 1996. Archived from the original on 20 January 2012. Retrieved 12 April 2014. ↑ Vishweshwar, P; McMahon, JA; Oliveira, M; Peterson, ML; Zaworotko, MJ (2005). "The predictably elusive form II of aspirin". Journal of the American Chemical Society. 127 (48): 16802–16803. doi:10.1021/ja056455b. PMID 16316223. ↑ Bond, Andrew D; Boese, Roland; Desiraju, Gautam R (2007). "On the polymorphism of aspirin: crystalline aspirin as intergrowths of two "polymorphic" domains". Angewandte Chemie International Edition. 46 (4): 618–622. doi:10.1002/anie.200603373. PMID 17139692. ↑ Vane, John Robert (1971). "Inhibition of prostaglandin synthesis as a mechanism of action for aspirin-like drugs". Nature: New Biology. 231 (25): 232–5. doi:10.1038/newbio231232a0. PMID 5284360. ↑ Vane JR; Botting RM (2003). "The mechanism of action of aspirin" (PDF). Thrombosis Research. 110 (5–6): 255–8. doi:10.1016/S0049-3848(03)00379-7. PMID 14592543. ↑ "The Nobel Prize in Physiology or Medicine 1982". Nobelprize.org. ↑ "Aspirin in heart attack and stroke prevention". American Heart Association. Archived from the original on 31 March 2008. Retrieved 8 May 2008. ↑ Tohgi, H; S Konno; K Tamura; B Kimura; K Kawano (1992). "Effects of low-to-high doses of aspirin on platelet aggregability and metabolites of thromboxane A2 and prostacyclin". Stroke. 23 (10): 1400–1403. doi:10.1161/01.STR.23.10.1400. PMID 1412574. ↑ Achhrish goel; Ruchi gupta; Anubhav goswami; Madhu soodan; sharma Yogesh sharma (2011). "Pharmacokinetic solubility and dissolution profile of non-steroidal anti-inflammatory drugs". 2 (3). ↑ Martínez-González J; Badimon L (2007). "Mechanisms underlying the cardiovascular effects of COX-inhibition: benefits and risks". Current Pharmaceutical Design. 13 (22): 2215–27. doi:10.2174/138161207781368774. PMID 17691994. ↑ Funk CD; FitzGerald GA (November 2007). "COX-2 inhibitors and cardiovascular risk". Journal of Cardiovascular Pharmacology. 50 (5): 470–9. doi:10.1097/FJC.0b013e318157f72d. PMID 18030055. ↑ Romano M, Cianci E, Simiele F, Recchiuti A (2015). "Lipoxins and aspirin-triggered lipoxins in resolution of inflammation". European Journal of Pharmacology. 760: 49–63. doi:10.1016/j.ejphar.2015.03.083. PMID 25895638. ↑ Serhan CN, Chiang N (2013). "Resolution phase lipid mediators of inflammation: agonists of resolution". Current Opinion in Pharmacology. 13 (4): 632–40. doi:10.1016/j.coph.2013.05.012. PMC 3732499 . PMID 23747022. ↑ Weylandt KH (2015). "Docosapentaenoic acid derived metabolites and mediators - The new world of lipid mediator medicine in a nutshell". European Journal of Pharmacology. doi:10.1016/j.ejphar.2015.11.002. PMID 26546723. ↑ Somasundaram; Sigthorsson, G; Simpson, RJ; Watts, J; Jacob, M; Tavares, IA; Rafi, S; Roseth, A; Foster, R; et al. (2000). "Uncoupling of intestinal mitochondrial oxidative phosphorylation and inhibition of cyclooxygenase are required for the development of NSAID-enteropathy in the rat". Alimentary Pharmacology & Therapeutics. 14 (5): 639–650. doi:10.1046/j.1365-2036.2000.00723.x. PMID 10792129. ↑ Paul-Clark, Mark J; Cao, Thong van; Moradi-Bidhendi, Niloufar; Cooper, Dianne & Gilroy, Derek W (2004). "15-epi-lipoxin A4–mediated induction of nitric oxide explains how aspirin inhibits acute inflammation". The Journal of Experimental Medicine. 200 (1): 69–78. doi:10.1084/jem.20040566. PMC 2213311 . PMID 15238606. ↑ McCarty, M. F.; Block, K. I. (2006). "Preadministration of high-dose salicylates, suppressors of NF-kappaB activation, may increase the chemosensitivity of many cancers: an example of proapoptotic signal modulation therapy". Integrative Cancer Therapies. 5 (3): 252–268. doi:10.1177/1534735406291499. PMID 16880431. ↑ Hawley, SA; Fullerton, MD; Ross, FA; Schertzer, JD; Chevtzoff, C; Walker, KJ; Peggie, MW; Zibrova, D; Green, KA; Mustard, KJ; Kemp, BE; Sakamoto, K; Steinberg, GR; Hardie, DG (2012). "The ancient drug salicylate directly activates AMP-activated protein kinase". Science. 336 (6083): 918–922. doi:10.1126/science.1215327. PMC 3399766 . PMID 22517326. ↑ Raffensperger, Lisa (19 April 2012). "Clues to aspirin's anti-cancer effects revealed". New Scientist. 214 (2862): 16. doi:10.1016/S0262-4079(12)61073-2. ↑ Alfonso LF, Srivenugopal KS, Arumugam TV, Abbruscato TJ, Weidanz JA, Bhat GJ (2009). "Aspirin inhibits camptothecin-induced p21CIP1 levels and potentiates apoptosis in human breast cancer cells". International Journal of Oncology. 34 (3). doi:10.3892/ijo_00000185. PMID 19212664. ↑ Alfonso LF, Srivenugopal KS, Bhat GJ (2009). "Does aspirin acetylate multiple cellular proteins?". Molecular Medicine Reports (review). 2 (4). doi:10.3892/mmr_00000132. PMID 21475861. ↑ Ferguson, RK; Boutros, AR (17 August 1970). "Death following self-poisoning with aspirin". Journal of the American Medical Association. 213 (7): 1186–8. doi:10.1001/jama.213.7.1186. PMID 5468267. ↑ Kaufman, FL; Dubansky, AS (April 1970). "Darvon poisoning with delayed salicylism: a case report". Pediatrics. 49 (4): 610–1. PMID 5013423. 1 2 3 Levy, G; Tsuchiya, T (31 August 1972). "Salicylate accumulation kinetics in man". New England Journal of Medicine. 287 (9): 430–2. doi:10.1056/NEJM197208312870903. PMID 5044917. ↑ Hartwig, Otto H (14 November 1983). "Pharmacokinetic considerations of common analgesics and antipyretics". American Journal of Medicine. 75 (5A): 30–7. doi:10.1016/0002-9343(83)90230-9. PMID 6606362. ↑ Done, AK (November 1960). "Salicylate intoxication. Significance of measurements of salicylate in blood in cases of acute ingestion". Pediatrics. 26: 800–7. PMID 13723722. ↑ Chyka PA, Erdman AR, Christianson G, Wax PM, Booze LL, Manoguerra AS, Caravati EM, Nelson LS, Olson KR, Cobaugh DJ, Scharman EJ, Woolf AD, Troutman WG (2007). "Salicylate poisoning: an evidence-based consensus guideline for out-of-hospital management". Clinical Toxicology. American Association of Poison Control Centers; Healthcare Systems Bureau, Health Resources and Services Administration, Department of Health and Human Services. 45 (2): 95–131. doi:10.1080/15563650600907140. PMID 17364628. ↑ Prescott LF, Balali-Mood M, Critchley JA, Johnstone AF, Proudfoot AT (1982). "Diuresis or urinary alkalinisation for salicylate poisoning?". British Medical Journal (Clinical Research Edition). 285 (6352): 1383–6. doi:10.1136/bmj.285.6352.1383. PMC 1500395 . PMID 6291695. ↑ Dargan PI, Wallace CI, Jones AL (2002). "An evidenced based flowchart to guide the management of acute salicylate (aspirin) overdose". Emergency Medicine Journal. 19 (3): 206–9. doi:10.1136/emj.19.3.206. PMC 1725844 . PMID 11971828. ↑ Goldberg, Daniel R. (Summer 2009). 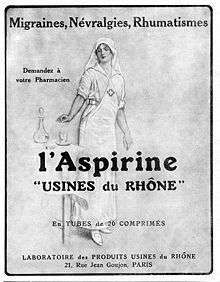 "Aspirin: Turn of the Century Miracle Drug". Chemical Heritage Foundation. ↑ Bayer Co. v. United Drug Co. , 272 F. 505, p.512 (S.D.N.Y 1921) (“Disregarding this, however, it was too late in the autumn of 1915 to reclaim the word which had already passed into the public domain. If the consuming public had once learned to know 'Aspirin' as the accepted name for the drug, perhaps it is true that an extended course of education might have added to it some proprietary meaning, but it would be very difficult to prove that it had been done in 17 months, and in any case the plaintiff does not try to prove it. [...] Yet, had it not been indifferent to the results of selling to the consumer, it could have protected itself just as well at the time when consumers began to buy directly as in 1915. Nothing would have been easier than to insist that the tablet makers should market the drug in small tin boxes bearing the plaintiff's name, or to take over the sale just as it did later. Instead of this, they allowed the manufacturing chemists to build up this part of the demand without regard to the trademark. Having made that bed, they must be content to lie in it. Hence it appears to me that nothing happening between October 1915, and March 1917, will serve to turn the word into a trademark.”). ↑ CBE Style Manual Committee; Huth, Edward J. (1994). Scientific style and format: the CBE manual for authors, editors, and publishers. Cambridge University Press. p. 164. ISBN 978-0-521-47154-1. ↑ "Aspirin: the versatile drug". CBC News. 28 May 2009. ↑ Cheng, Tsung O. (2007). "The history of aspirin". Texas Heart Institute Journal. 34 (3): 392–393. PMC 1995051 . PMID 17948100. ↑ Sigma Aldrich. "Aspirin". Archived from the original on 18 August 2011. Retrieved 13 July 2009. ↑ British Pharmacopoeia. "Index BP 2009" (PDF). Archived from the original (PDF) on 11 April 2009. Retrieved 13 July 2009. ↑ Crosby, Janet Tobiassen (2006). "Veterinary questions and answers". About.com. Archived from the original on 8 September 2007. Retrieved 5 September 2007. ↑ Cambridge H, Lees P, Hooke RE, Russell CS (1991). "Antithrombotic actions of aspirin in the horse". Equine Veterinary Journal. 23 (2): 123–7. doi:10.1111/j.2042-3306.1991.tb02736.x. PMID 1904347. ↑ Lappin, Michael R, ed. (2001). Feline internal medicine secrets. Philadelphia: Hanley & Belfus. p. 160. ISBN 1-56053-461-3. ↑ "Analgesics (toxicity)". Merck. Retrieved 3 March 2016. ↑ "Plants poisonous to livestock". Cornell University Department of Animal Science. Retrieved 3 March 2016. Jeffreys, Diarmuid (11 August 2005). Aspirin: the remarkable story of a wonder drug. Bloomsbury. ISBN 1-58234-600-3. Sheldon Peter (2007). The fall and rise of aspirin the wonder drug. Brewin Books. ISBN 978-1-85858-403-4. Wikimedia Commons has media related to Aspirin. Ling, Greg (2005). "Aspirin". How Products are Made. 1. Thomson Gale.